Presenting Cormoran Strike #1 The Cuckoo Calling by Rober Galbraith (aka J.K. Rowling). A gripping, elegant mystery steeped in the atmosphere of London - from the hushed streets of Mayfair, to the backstreet pubs of the East End, to the bustle of Soho - The Cuckoo's Calling is a remarkable debut. Introducing Cormoran Strike, it is a classic crime novel unlike any other book you will read this year. J.K. Rowling is back with a bang. After 'Harry Potter' and then 'The Casual Vacancy' comes this surprisingly engaging whodunit suspense/thriller with a competent and ingenious Private Detective in the form of Cormoran Strike, who we can't help but like. 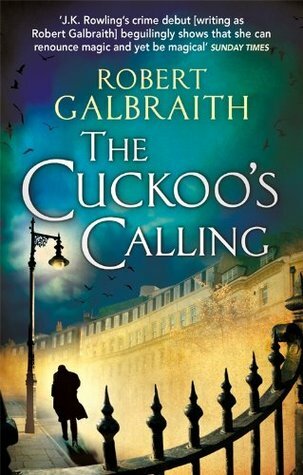 Of course The Cuckoo's Calling comes to us not under Ms. Rowling's own name but under a pseudonym Robert Galbraith (notice this seems to be the pseudonym of another author as well) .. Only later did it come out that it was Rowling who wrote it ...... and what a plot it is too. War veteran. Disabled and just broken up from his girlfriend and struggling in debts. Cormoran Strike strikes gold when he is hired to solve the suspicious suicide of model Lula Landry by her adoptive brother John Bristow. With his dubiously gigantic appearance, a rather eidetic memory and logically sound mind, Cormoran Strike was an instant favorite. Add in ecstatically enthusiastic secretary Robin who had always nurtured the secret desire to be an investigator, you get one hell of a good team and an instant hit book. Reads like a champ this book does. There is a certain flow to the written words that just keeps you hooked. You start from the first page and by the time you realize, you will have progressed much in the book ..... And this is what I admire most about a book, its ability to keep us tethered. The suspense, the thrill, the clues and most of all Strike's way of reasoning were what had us wondering .... who did it. Of course, Rowling maintains the suspense till the end and we are rightly left astounded by the reveal of the murderer. Admittedly I only got this book after it became known that she had written it but really it deserves all the praises. There is a new an competent detective on the horizon. With a well balanced and well developed plot, The Cuckoo's Calling easily ranks as some of the best whodunit fiction of recent years. While I liked Casual Vacancy, it will still come third to 'Harry Potter' and 'Cormoran Strike'. I have already read 'The Silkworm' and of course loved it too ..... so stay tuned for my review of it. A gem, this book is most certainly a gem. "Utterly compelling and irrevocably unputdownable"
I don't doubt that this is amazing, I just can't force myself to read it. I guess I have my irrational fear of disappointment to blame. I will eventually, though, I just need to gather the courage.